When our focus is on money it only means that everything else loses focus and is lost in the picture. This means that the object of our vision is money and nothing else. Generally speaking, we all perform activities in exchange for money or needs to be met. This is known as employment or work. Have you ever heard someone tell you “I just work here for the money.” Or “I need this job for the money.”? If our motive for employment is money, then that is where our focus lies. That’s really why we get out of bed. Either the job or the compensation becomes our god or gods. This is because the job is looked upon as our provider. Where is God in that equation? What is God’s role in that picture? If Jesus is truly our Lord and Master isn’t He the Ultimate Provider? He is the One responsible for seeing that our needs are taken care of. That’s His role. What has been dominating your thoughts? Colossians 3: 23 Work willingly at whatever you do, as though you were working for the Lord rather than for people. 24 Remember that the Lord will give you an inheritance as your reward, and that the Master you are serving is Christ. If we live by these verses and have them be our driving force, as if to say “Jesus wants me out of bed by 7:00 so that I can work for Him.” then our focus is placed on Him, not the job, nor the money. The job then becomes the work or the service that He’s given us to do, whether we enjoy it or not. Again, not to be misunderstood, I’m not saying never to leave your job either, as this message is simply a concept to change our heart and look at our daily work activities from a spiritual perspective. Whether you change jobs or not is between you and your Master, but rest assured that His desire is that we learn to trust in Him, and not our employer or the money they pay us. Psalm 34: 10 Even strong young lions sometimes go hungry, but those who trust in the Lord will lack no good thing. When God is clearly in focus, money becomes a tool and simply a blessing (or curse), nothing more. Looking back to the opening passage, “Such is the fate of all who are greedy for money; it robs them of life.” It’s no wonder that this is true. If our focus and motives are on anything but Jesus, who gives life, then we are robbed of that life. To summarize these thoughts I think I can say “Don’t work for money but for God’s great purposes.” An eternal purpose and a healthy fear of the Lord is a more powerful driving force than money. After all, who wouldn’t want to report to the God of all creation every day? Doesn’t this perspective change our attitude about everything we do? 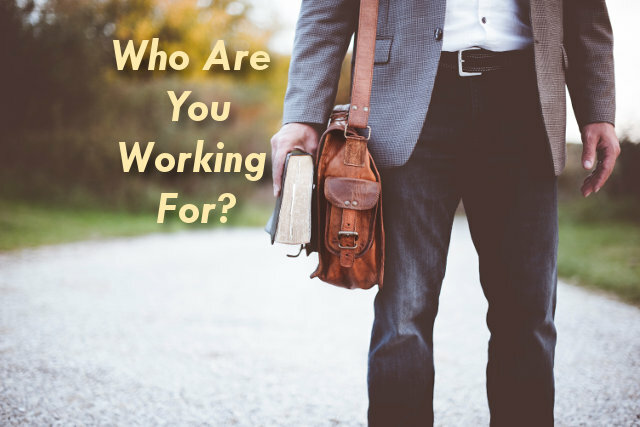 Why do you work and who do you work for? 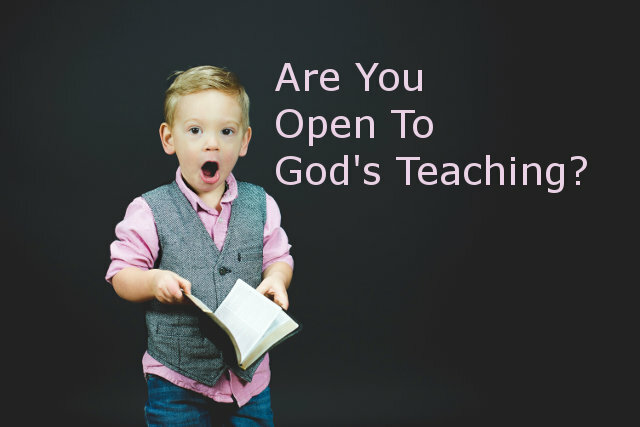 Are You Open To God’s Teaching? Are you allowing God to teach you? If only more people would seek God for His wisdom, personally, and learn from Him how to treat others the world would be a much better place wouldn’t it? Today I’d just like to examine a few passages that I think are great for learning godly interpersonal and parenting skills. Are you ready to learn from the Master? I think this one verse, if meditated on, can take us a long way towards being a loving person. It simply requires some careful thought when interacting with others in your life. Isn’t it amazing how this one sentence covers the essence of a vast portion of the Old Testament? Yet it’s so simple! Genesis 4: 8 One day Cain suggested to his brother, “Let’s go out into the fields.” And while they were in the field, Cain attacked his brother, Abel, and killed him. What I love about this is that God knew all along that Cain killed Abel. Instead of accusations, condemnation, and anger, God simply asks a question: “Where is your brother? Where is Abel?” He lovingly allows Cain to confess. He gives Cain a chance to repent. Perhaps you had or have a parent that is not so loving. A typical reaction for a parent to deal with a child who knowingly disobeyed is to yell, accuse and be quick to judge. God is not that way, isn’t that good news? Jonah 4: 6 And the Lord God arranged for a leafy plant to grow there, and soon it spread its broad leaves over Jonah’s head, shading him from the sun. This eased his discomfort, and Jonah was very grateful for the plant. In verse 8 Jonah states that he’d rather be dead and he was angry. What comes to my mind are the typical responses such as “You shouldn’t be angry.”, “Why are you angry?” or “I can’t believe you’re angry.” God takes a different path and asks “Is it right for you to be angry?” This changes everything doesn’t it? It requires Jonah to think about whether his heart is right and does not invalidate his feelings. Doesn’t Jonah remind you of a little kid? I find this exchange a bit comical, but I think it’s ignorance on my part as I cannot begin to relate to Jonah in this setting. You may wish to read a similar exchange with His servant Gideon in Judges 6: 11-14. This last verse sums it up, doesn’t it? 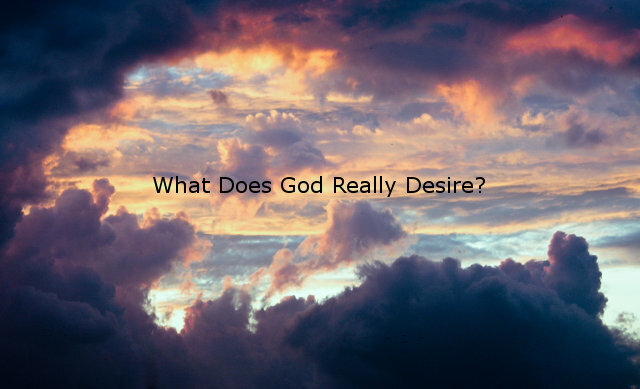 What Does God Really Desire? Psalm 30: 8 I cried out to you, O Lord. I thought to myself, “What can we give God that He doesn’t already have? What could He possibly want from me?” But there in the same verse is the answer! It is our praise that He desires. But does praise come automatically? If you meet someone for the first time, only spending a few minutes with them, will you be able to tell others about what a great person they are? Of course not. We praise God because of the good things He has done for us, the mercy He has shown us, and the lessons He teaches us. These experiences are really only appreciated after trusting in Him long enough to experience them. To know God is to love God, to love God is to trust God. Only when we place our trust in Him will we obey Him. It all starts with knowing God, and the more we do that, the more we desire to worship and serve Him. Praise will then naturally follow. If we’re created “for him”, shouldn’t we get to know Him? Because we are stamped “Made by God”, is He not the One we should go back to in order to live a proper life? After all, He’s the only One who would know what a “proper life” really is. This is the “Heart of the matter” and is in accordance with the greatest commandment. Isn’t it a good thing that it’s not about our good deeds outweighing bad deeds? Wouldn’t that drive you crazy? Ephesians 2: 9 Salvation is not a reward for the good things we have done, so none of us can boast about it. He is not interested in the money you tithe, but the motive behind it. He is not interested in the good deeds you do, but why you do them. My friends, God doesn’t want anything from you, He just wants you. 1 Peter 1:9 The reward for trusting him will be the salvation of your souls. Will you give Him all of your heart? 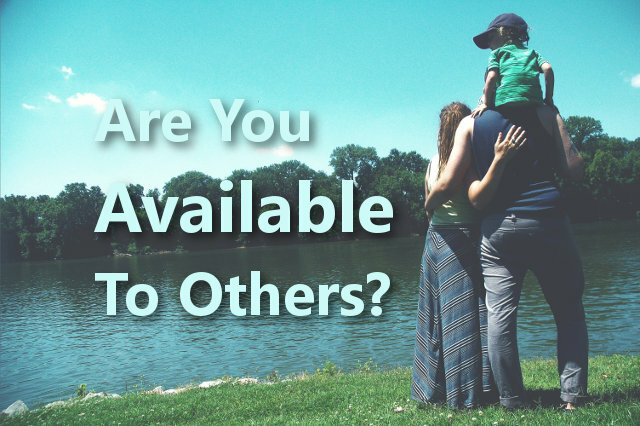 Are You Available To Others? What does being a Christian mean to you? Is it simply a label by which you claim your faith or does it mean something more to you? Today I’d like us to consider the following passage in 2 Corinthians 5 to set up our discussion of making ourselves available to others. It seems to me that this applies to all believers, doesn’t it? I kind of like the title, Ambassador of Christ, don’t you? Could you imagine going to a business mixer or a social gathering and introducing yourself in such a way? I can see it now, “Hello, my name is Larry, I’m an ambassador of Christ, and you are?” I don’t currently do this, but I may start. I may tell people about LarryPittman.com on occasion, but I may change my primary “business” to “Ambassador of Christ” and see where the conversation goes. But this is every believers’ title, from clerks and computer guys to doctors and dentists; for those whose identity is found in the risen Christ. Being an ambassador means that we represent Him, we are here on His behalf. People who are genuine seekers should naturally want to hear what we have to say and we should always look for ways to invite those with “ears to hear” to hear more. Are you available to the people in your life? Are you available to your neighbor? To make yourself available to others is to make yourself available to God. These verses in John seems to clarify this verse. John 13: 34 So now I am giving you a new commandment: Love each other. Just as I have loved you, you should love each other. John 15: 12 This is my commandment: Love each other in the same way I have loved you. The Word of God allows us to easily see how Jesus loved others. Let’s peruse some passages and examine how Jesus made Himself available to those He came across. Matthew 19: 13 One day some parents brought their children to Jesus so he could lay his hands on them and pray for them. But the disciples scolded the parents for bothering him. 14 But Jesus said, “Let the children come to me. Don’t stop them! For the Kingdom of Heaven belongs to those who are like these children.” 15 And he placed his hands on their heads and blessed them before he left. Apparently, Jesus was doing something at the time and the disciples felt that He should not be bothered. This is a great illustration of Jesus accepting all who come to Him despite others that would send them away. I think this is a similar example, but what I love is the sheer determination of this man who does not allow the crowd to become between Jesus and himself. Jesus could have ignored him easily and walked on, but He chose to address the man’s needs and be available. Mark 6: 30 The apostles returned to Jesus from their ministry tour and told him all they had done and taught. 31 Then Jesus said, “Let’s go off by ourselves to a quiet place and rest awhile.” He said this because there were so many people coming and going that Jesus and his apostles didn’t even have time to eat. Notice that in verse 31 Jesus wants to rest and go to a quiet place. It also says that they didn’t even have time to eat. Something changes His plan and redirects His attention. Note verse 34, “Jesus saw the huge crowd as he stepped from the boat, and he had compassion on them because they were like sheep without a shepherd.” Despite being hungry, tired and wanting a quiet place to rest, He sees an immediate, and more important need and starts teaching. You see He valued their spiritual hunger more than His disciples’ physical hunger. I don’t know about you, but when I am hungry, I want to eat. I can easily forget about other’s needs for a minute while I get a bite to eat. Luke 8: 41 Then a man named Jairus, a leader of the local synagogue, came and fell at Jesus’ feet, pleading with him to come home with him. 42 His only daughter, who was about twelve years old, was dying. As Jesus went with him, he was surrounded by the crowds. 43 A woman in the crowd had suffered for twelve years with constant bleeding, and she could find no cure. 44 Coming up behind Jesus, she touched the fringe of his robe. Immediately, the bleeding stopped. Note that Jesus was on His way to heal Jairus’ only daughter, who was dying. On the way to serve in this most urgent matter, He was interrupted. The woman touched Him so that she might be healed. He took the time to find out who she was and addresses her. In the meantime, if you read on you’ll see that Jairus’ daughter dies but it’s not too late for the Savior. 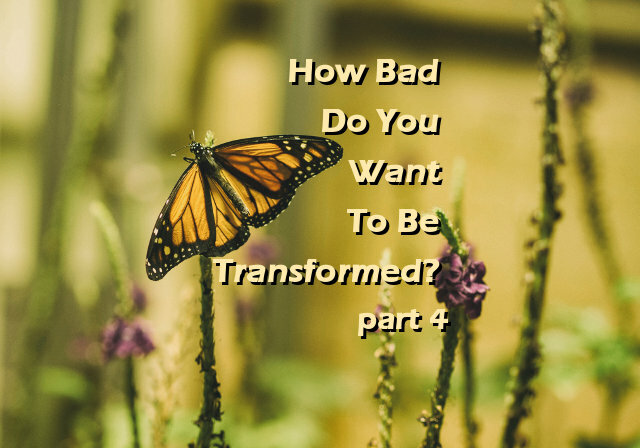 As we continue to seek God and continue to be transformed as we’ve discussed, we should start to see evidence that we are becoming more and more like Him. How do you respond to these everyday, ordinary questions? Daddy, can you come see what I’ve made? Do you think you could help me move this Sunday? I need you to pick up an extra shift, can you help me out? Could you run me to the doctor’s office? Daughter, could you come out to visit your Dad and I this weekend? Do you see questions, requests, or demands as an interruption? Or do you see them as an opportunity to serve? An opportunity to love someone as God would love them? Perhaps they are ways to fulfill your responsibility as an ambassador, which is actually working for God while serving others. Luke 7: 3 When the officer heard about Jesus, he sent some respected Jewish elders to ask him to come and heal his slave. Do people come to you to ask for prayer or for advice? Do people come to you for comfort or for peace of mind? Or do people think that you’re too busy or uncompassionate that they don’t bother going to you? If you look at your life, are you available to others? Are you there to serve when needed? Have you considered God’s plan for you as a living sacrifice? If we are truly ambassadors for Christ, doesn’t that make Him our employer? If we work for Him, doesn’t it make sense that he would have people come into our lives to give us a chance to bless them and perfect our love? Romans 8: 29 For God knew his people in advance, and he chose them to become like his Son, so that his Son would be the firstborn among many brothers and sisters. 1 Peter 1: 22 You were cleansed from your sins when you obeyed the truth, so now you must show sincere love to each other as brothers and sisters. Love each other deeply with all your heart. 1 Peter 3: 8 Finally, all of you should be of one mind. Sympathize with each other. Love each other as brothers and sisters. Be tenderhearted, and keep a humble attitude. 1 John 3: 18 Dear children, let’s not merely say that we love each other; let us show the truth by our actions. Are you willing to serve when you are called? 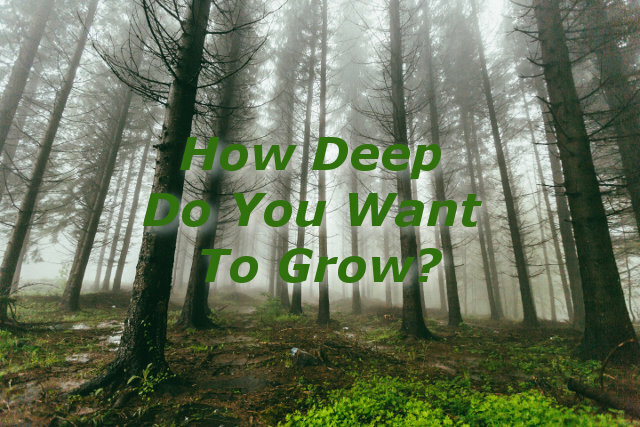 How Deep Do You Want To Grow? I believe that the depth of our growth directly relates to the frequency of the fruit we bear. 2 Corinthians 9: 6 Remember this—a farmer who plants only a few seeds will get a small crop. But the one who plants generously will get a generous crop. In addition to daily Bible reading, I have set aside some time to read additional materials that further stimulate my spiritual growth. A very dear friend of mine encouraged me to read the book entitled “They Found the Secret” by V. Raymond Edman. The author of the book compiled mini-biographies of 20, mostly well-known, saints who have lived from the 1600’s through the 1900’s. Some of the lives he writes about include John Bunyan, Oswald Chambers, D.L. Moody, Amy Carmichael, Andrew Murray and J. Hudson Taylor. The common thread throughout the book is that each of the subjects had a great love for God and were serving Him in the way they were led. In each of their stories, they share an experience of a deeper relationship with God or a greater presence of the Holy Spirit in their lives. I don’t know about you but this gives me hope! John 17: 21 I pray that they will all be one, just as you and I are one—as you are in me, Father, and I am in you. And may they be in us so that the world will believe you sent me. I don’t think there is any way that the disciples could understand what Jesus is saying here. Do you understand what He means when He says “that they will all be one“? I am learning that this is a very advanced topic and that He has not yet led me to fully understand it. But I strongly believe that He will, as long as I continue to sit at his feet and long for more. Referring back to the book I mentioned, those characters seemed to understand this verse. I think that only after the day of Pentecost could the disciples understand it. Have you ever had a “pentecostal” experience that took you to a deeper relationship with the risen Savior? This is not to be confused or limited to the Pentecostal denominations, by the way. You will only grow as deep as those you surround yourself with. If you are currently limiting your interaction with God and His Word on Sundays, Wednesdays and these messages, you will not grow as deep as those interacting with Him daily, seeking Him on a more frequent basis. If the believers you currently spend time with are not taking His Word seriously or are not wanting a deeper relationship with Him then you will either walk along with them or be so discontent that you will find others to “walk with”. If your pastor does not inspire you to seek a richer spiritual life then God may either be telling you to support him in prayer or to find one who has a closer walk with God. The bottom line is that you can grow as close to God as much as you desire. It is up to you. The choice is yours. I am convinced that God desires this for your life, wherever you currently are. James 4: 8 Come close to God, and God will come close to you. Jesus is alive and you can get to know Him and follow Him just as the great saints that have gone before us knew, from Abraham to Billy Graham. Jesus was there for each of them. What they all had in common was “close fellowship with God”, which you can experience today. If your exposure to God’s teaching is limited only to and filtered by what one leader has to share, then you will only grow as deep as they can lead you. However, if we know Jesus personally and seriously acknowledge Him as The Teacher, the depths to which we can grow are limitless. God’s Word is inexhaustible and it knows no bounds. He will lead you down His perfect and pleasing path. Acts 4: 13 The members of the council were amazed when they saw the boldness of Peter and John, for they could see that they were ordinary men with no special training in the Scriptures. They also recognized them as men who had been with Jesus. This concept that I am addressing can be found in nature and I think makes complete sense when viewed in that light. A couple of these examples are fish only grow as big as their surroundings allow. And a plant will only grow as big as the pot they are planted allows. Think about the trees planted along the riverbed as in Psalm 1 above. When we are planted in the Branch, the everlasting, living God, the Creator of all things seen and unseen, how deep do you think we can grow?